A few years ago as I was asking the Lord what he wanted to me to improve and He said: "Humility!" I didn't know how to become humble. I desired it, but decided to leave it in the Lord's hands, while simultaneously asking God to lead me to be humble. Soon after that the Lord enabled me to understand my situation before Him and I felt crushed, but seeing myself as I truly am enabled me to overcome some of my pride and have some humility. Looking back on that experience, I could have chosen to remain prideful, despite what the Lord was telling me, but I wanted to change. I wanted to be humble. I have come to realize that humility is multifaceted and that there is pride in other areas of my life. Several times, the Lord has given me truth which helps me tackle my pride in those specific areas. I have come to see that while we can be humble in some areas, great pride can exist in others and it takes a long time to conquer these things. Humility is simply acknowledging the truth of and yielding to our position before God. When we don't see our position before Him accurately, this is an indication that we probably have pride. However, most believe they already have a correct perception of their position before God. Without seeking humility, it is not an attribute that will develop by itself, since we have to learn, accept, and live truth to be humble. Pride is the root of every sin. When you sin, know that you are still prideful. Our sins are a manifestation of desiring our own will rather than God's, which is pride. It is a manifestation of our lack of understanding of our position before God. It means we love ourselves more than others. Pride involves any kind of self-seeking, self-praise, and self-will. In other words, when we do our own will instead of God's will alone, we are manifesting our pride. You may think to yourself: I am doing God's will in my life. Yet, consider all your actions, thoughts, feelings, and words. These are the test of your humility or your pride. Are all of these aligned with God's will? If not, you have pride in you. Any form of gossip, backbiting, lack of forgiveness, jealousy, envy, impatience, taking offense, dishonesty (even if seemingly harmless), hard thoughts, sharp words (unless the Spirit instructs), temper, unkindness, hasty judgments, irritation, indifference to others needs and feelings, and so on shows our pride. We are seeking our own. I have always been impressed with one Canaanite woman. One day she approached Jesus and begged him to heal her daughter. Jesus ignored her and his disciples begged Him to send her away. Think about how you would respond in that situation? Would you walk away in a prideful huff? Jesus then said he was only sent to the lost sheep of Israel. She continued begging Him and He referred to her as a dog, saying, "It is not meet to take the children’s bread, and to cast it to dogs." Consider how you would feel if you were treated like this by Jesus. What about being treated like this by some other person? Would your pride lead you to get offended, angry, or despondent? Not this woman! Whether she struggled with pride in the past or not, she responded to Jesus testing her, "Truth, Lord: yet the dogs eat of the crumbs which fall from their masters’ table." This is humility!!! Jesus then exclaimed that due to her great faith her daughter was healed. (Matthew 15:22-28) You cannot have great faith without great humility. 26 I speak to the world those things which I have heard of him. 28 ... I do nothing of myself; but as my Father hath taught me, I speak these things. Nephi equated pride with vain imaginations (1 Nephi 12:18) and "the world and the wisdom thereof" (1 Nephi 11:35). If truth is knowing things as they are (Doctrine and Covenants 93:24), when we have false or partially false beliefs, we do not see things as they are. While humility is accurately and truthfully seeing ourselves, our sins, and others before God, pride is having false beliefs regarding these things. These false beliefs are what feeds our weaknesses and sins. For example, if I have a weakness of feeling frustrated with my children, it is because I have some false belief regarding my role as a mother, I am not seeing them as God sees them, or any other false belief. Or, if I am jealous, I may have false beliefs about the way my marriage ought to be or about myself needing to control others. Until I rid myself of those false beliefs, I will never rid myself of those weaknesses. 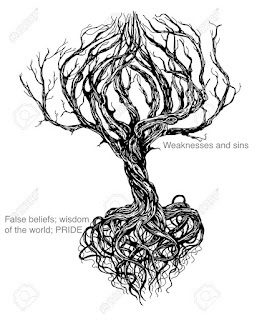 Our false beliefs are like the roots of a tree. Just as roots are underground, often not much is known about our false beliefs (and sometimes we are unaware of their existence). Yet, more often our weaknesses and sins are visible to ourselves and others. Our false beliefs are generally tangled and intertwined with each other and in order to replace our wisdom and understanding with God's truth, it takes much time, patience, perseverance, and work to uncover and untangle them. They rarely uncover themselves. Furthermore, some are deeper than others and are harder to remove. We have to constantly be trying to seek them out and replacing them with truth. Without great desire to uncover our false beliefs, we will never be open enough to recognize that some of the truths we cling to so vehemently are actually not all true. 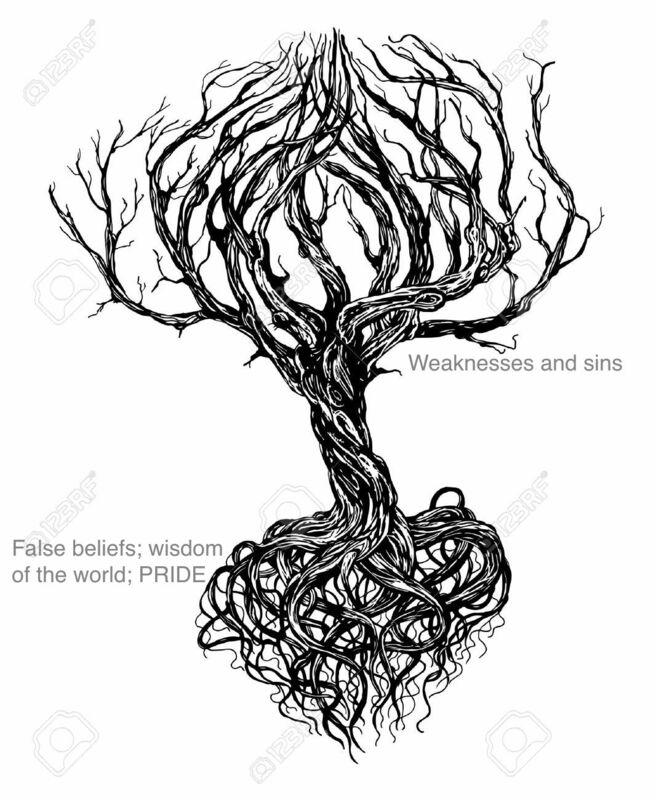 As we identify our underlying beliefs, discern what is false, and learn and assimilate what is true, our root system will no longer be a tangled knot that gives little life to the tree. However, the minute we stop seeking to know our false beliefs, our progression slows and we are left at Satan's mercy. In effect, we become damned in our progression. I have several weaknesses which I thought were independent of each other. Recently as I was praying about it, the Lord helped me understand how despite them seeming independent, they all shared a common false belief and if I eradicated that false belief and replaced it with truth, each of these weaknesses would be eradicated. I felt some relief upon learning this, but at the same time I knew that changing this false belief was not a trivial matter. It is going to be painful and take a lot of work. While some weaknesses are easy to eradicate, others just take longer. With the weaknesses that are more ingrained in you, consider that you have false or partially false beliefs regarding yourself and/or others and the only way to overcome those weaknesses is to determine the underlying false beliefs and correct those. While we are sometimes completely unaware of our false beliefs, God can help us see the truth. Correcting false beliefs is difficult though. Often it is painful seeing ourselves and others as we really are. Other times we lack faith to let go of the way we see things and it feels scary and dangerous. But without accepting the truth, we cannot overcome those weaknesses. 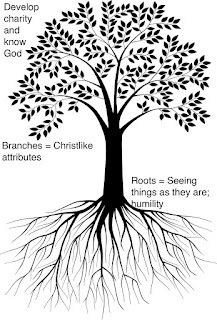 As we slowly untangle the roots and determine what our false beliefs are and replace them with truth, we are able to develop humility. We see ourselves and others more from God's perspective. 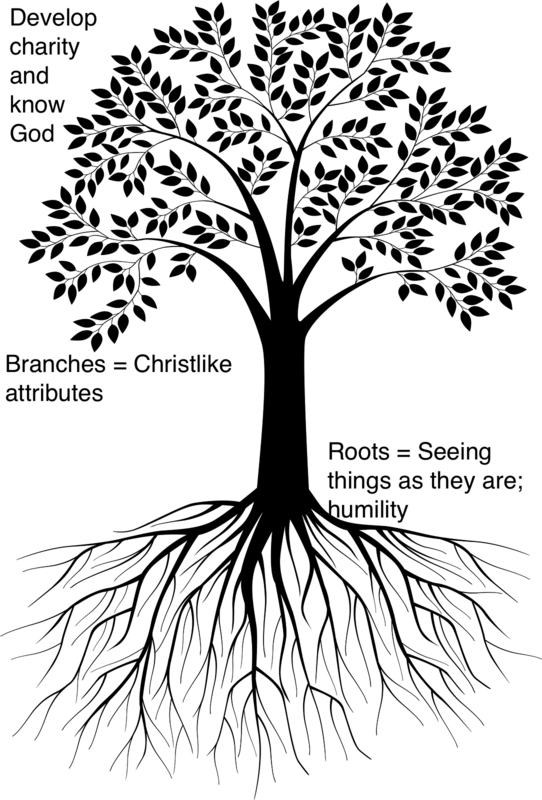 It is our humility that enables us to develop Christlike attributes and characteristics. While your false beliefs will always lead you into sin at some point, whether it be an outward action or an inward feeling of the heart, once you see yourself, others, and situations more accurately, it becomes easier to be patient and selfless and kind with others. Then over time, you will be enabled to develop patience, or mercy, or kindness, and so on and not just practice it. It will become part of your nature. As a result of possessing these attributes, God will bestow charity on you and you will come to know Him as He is. There is a certain situation in which I've struggled to act in Christlike ways. As I have been begging God to help me overcome this weakness, He gave me some truth. In that moment, I saw myself and the other people involved in a very different way. For days I kept pondering on these things. My aim was to incorporate this truth into my belief system. I then had that same type of experience that I so often have struggled with in the past. Knowing truth did not make the experience easy. Instead, it was still difficult and painful, but due to what I understood, I was able to act in accordance with God's will. I know that through having many such experiences I can become a changed person so that those Christlike characteristics of love and mercy are a natural part of who I am. It is then that I can truly come to know Jesus. Humility is the foundation of holiness. When your thoughts, words, feelings, and actions towards others are pure and align perfectly with God's will, your humility is demonstrated. Humility will always lead you to let go of every outward sin and every impure condition of the heart, until you become pure and holy and are able to to stand confidently in the presence of God. On the other hand, there is nothing quite so dangerous as the pride that leads us to consider ourselves pure and holy before God. We may not explicitly think: "I am better/holier/closer to God than so and so." But, inside we compare and we notice how advanced we are in a specific ways compared to others. Any self-recognition or self-praise is pride. This kind of pride is difficult to overcome because it is either something we are not consciously aware of or we believe it to be legitimately true and justified. Self-hate is another aspect of pride. When we self-hate or self-pity, we focus on ourselves and until we let go of that, we will never be humble. Knowing the truth of our position before God and accurately seeing the position of others before God will always lead us to feel love for ourselves, God, and others. If the fruit of our understanding is not love, there is likely something wrong with our understanding. If we want to be humble, we have to hunger and thirst for it. Seek after it. When God has shown me my true sinful state, it is incredibly painful in my heart until I embrace the truth. Even though I know that He shows me these things because He loves me, the pain comes because I struggle to let go of my false beliefs. Often we run and hide from the truth because we don't want painful and heart-wrenching experiences, but it is the only way. When you hunger and thirst for the truth and for sanctifying experiences, you no longer simply endure those trials. Instead you look at them with joy and gladness, despite the pain. Those experiences are no longer a burden and you feel gratitude for them. Obtaining greater and greater humility is the secret to a greater degree of joy and peace. Hunger for humility, knowing you cannot be sanctified without it. Learn to see yourself as you are in relation to God. Rejoice and accept the experiences that come that can teach you humility. Use every opportunity to act in humble ways. Seek God's will constantly in every thought, word, and action. Then, in time you will find that you are becoming humble. You will begin to develop the attributes of Jesus and you will be filled with love for yourself, others, and God. I love your thoughts presented here and the spirit tells me it is true. Sometimes I am a slow learner and my own faults are hard to see. It would be helpful in my self assessment if you would share either some generic examples of false truths that lead to pride or if you are comfortable, some of the ones that you learned of in yourself. Comment Policy: Add some light and love to the conversation! Background Image Copyright of Adam Block/Mount Lemmon SkyCenter/University of Arizona. Simple theme. Powered by Blogger.